In episode 195 - Battle of the Idols, national MC Yoo Jae Suk dressed in a retro colourful shirt and hosted the event. He kept complaining about his shirt which make him feel awkward. Little did he know that the colors on his shirt symbolize the group colour. The first Idol group which performed was 2PM! Song Ji Hyo put on dark red lipstick which in my opinion, look pretty weird. She would have indulge in her dream, until Yoo Jae Suk commented that she look like their auntie and not 'noona'. 2NE1 performed their song with Gary and Kim Jong Kook. That look pretty hot and i like their dance! Jong Kook even demostrated his hip hop dance step and his instruction Voiceover.. That really tickles me! Hahaha. Yoo Jae Suk even teased Jong Kook about his El Tigre sweater. The last idol group belonged to the 80s! Kwang Soo, Haha and Ji Suk Jin joined the Mystic 89. Their dances was so old school and some of them even forgot about their dance step. In ths end, they turned around in a circle. They were divided into three groups: Green - 2NE1, Blue - 2PM, Orange - Mystic 89). Their first mission is to complete a marathon race and the reward for the winner is to broadcast their MTV on the big screen for one whole day. Each group member were separate to complete their individual mission. Their final goal is to hand over the tape to the video room. The first group that does so win the race. MC Yoo job for the day is to conduct live report. I like this mission because we get to see their stamina and it was fun to see them running. The mission about walking the dog was also interesting. Poor Ji Suk Jin, he had a hard time with the dog after he pat her head. On the other hand, Kim Jong Kook looked so hot when he carried CL (2NE1). CL felt sorry about her weight. However, Jong Kook does not seem to mind at all! They completed the mission first. Despite their lead, Gary make a silly mistake by dashing off in his flippers without taking the tape. Therefore, he had to start all over again. In the end, the blue group won the race. The second mission was guessing the food preference of MC Yoo. Jong Kook questioned why they have to guess his favorite foods, to which MC Yoo dish an advice to everyone not to pick what Jong Kook chooses. Time for some food sampling and it was no surprise that MC Yoo chose the Ramen. He reasoned that the noodles will turn soggy if soaked in the soup for too long. Next, he chose the ice cream, stating that it will melt. He put the ice cream in and out of his mouth to keep everyone in suspense. Suddenly, Jong Kook commented that MC Yoo expression looked 'dirty'! Finally, MC Yoo took a big bite on the Ice cream. MC Yoo chose the fried chicken next and Jong Kook was so excited about it. He adorably dance infront of Yoo Jae Suk while showing his choice. Last of all, he ate the bread. Next, the groups have to guess if MC Yoo could achieve 18 chin up at the metal pole. It was touching that everyone cheered for MC Yoo and he did it! The Green group won and they received a benefit for the final mission. Finally, the last mission was a nametag ripping game. The green group can use the benefit to forfeit a player in the other team from playing. The blue group was chosen and Ji Hyo was unfortunately eliminated. The orange group was technically the weakest, thus they agreed to betray the other team. Gary did well enough and put up a good fight with the other teams. On the other hand, Kwang Soo was betrayed by Nichkhun. The next player Minzy nametag was torn as soon as she was found. Spartakook was angry that the guys were collaborating to eliminate a girl, thus he wanted 'revenge'!!! 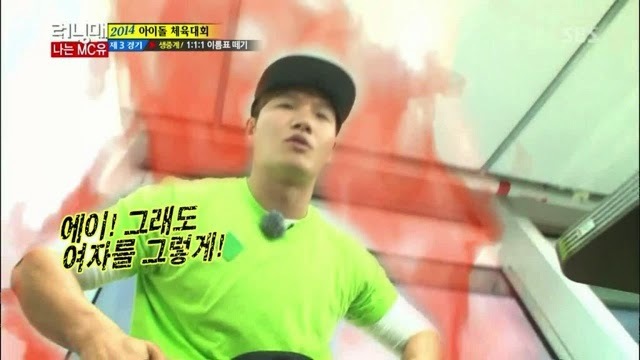 Honestly, it was gratifying to see Jong Kook running in top speed and getting everyone eliminated! Finally, Spartakook in action and it has been a long time since I saw tiger on fire! Gary commander team was so strong and powerful. It was simply wonderful that they took this nametag ripping game more seriously. Kookie the cute tiger was so adorable in this episode when he ran around and did a little dance infront of Yoo Jae Suk. Lastly, the hip hop dance sealed the deal and make it one of the best (must watch) episode for this year. I was highly entertained in this episode with a competent MC Yoo, cute Kookie, Gary commander team, fun games, entertaining guests and a great showdown. Well if only ace Ji Hyo was allowed to show her skills.. Hehe.